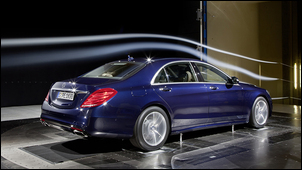 Mercedes Benz is one of the very few companies to have a long-term aerodynamic focus in the development of their vehicles. Here we take a look at the aero development of the S-class (and its predecessors) from the 1950s to the 1990s. 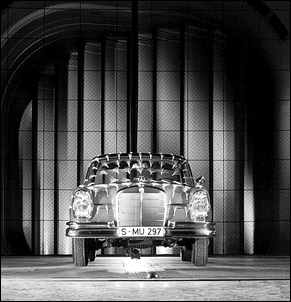 The presentation of the model 220 (W 180) in Geneva in March 1954 marked the paradigm shift where the significance of aerodynamic drag was to be truly taken into account in the design of a Mercedes S-class predecessor. 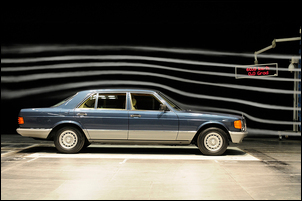 Developed in parallel and presented seven months prior, the mid-sized model 180 (W 120), which corresponded largely to the model 220 (W 180) in terms of its body, was described by Chief Engineer Nallinger as embodying the “link between the traditional Mercedes-Benz design and a new-age, aerodynamically efficient overall design”. The 220 had a drag coefficient of 0.473 and a frontal area of 2.07 square metres, giving a total drag value of 0.9791. Those figures might sound bad, but compared to pre-war Mercedes sedans (shown in the following table), they were actually good! Compared with the previous W 180 model series, the drag coefficient of the 1959 W 111 model series improved by 13 per cent. Despite a 3.86 per cent larger front surface area, the total aerodynamic resistance obtained by multiplying A by cd dropped by 9.7 per cent. In the “Heckflosse”, the arched design of the roof and the high rear end of the boot lid had a favourable effect which reduced flow losses. Aerodynamic issues were not a design priority with the W 108/109 model series of 1965. In fact, the flatter roof and lower rear end of the W 108 resulted in a poorer drag coefficient than the predecessor W 111. Nevertheless, the total drag achieved stayed about the same: a 2.2 per cent higher cd value was accompanied by a 1.9 per cent decrease in front surface area, resulting in a nearly identical total drag. 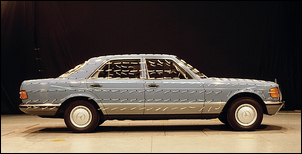 The W 116 model series, the first to be called Mercedes-Benz S-Class in official communications, achieved nearly the same Cd as the W 111 model series due to its high rear end and it scored a little better in total resistance. 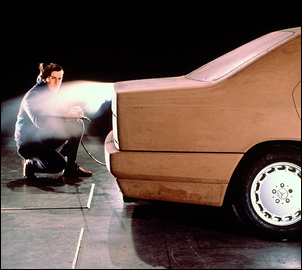 When planning the W 126 model series, Werner Breitschwerdt, then Chief Developer in Sindelfingen and later Chief Engineer, focused his attention on the consumption-influencing factors of weight and aerodynamic drag. The major optimising factors for a favourable drag coefficient were the sharper falling slope of the roofline, the high rear end with its rearward structure slightly tucked in at the sides, the steeper inclination of the windscreen (54 degrees), the recessed windscreen wipers, drip moulding integrated into the body, a stepless transition of the front wall pillars and a seamless transition from the bumpers to the body. The success of all these measures was impressive: the Cd value improved compared with the predecessor W 116 model series by 12.9 per cent. The front surface area decreased by roughly 1 per cent, and the total resistance by 13.3 per cent. 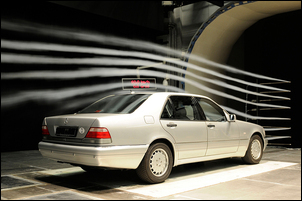 When designing the W 140 model series, which was finished in 1991, engineers likewise devoted their attention to the aerodynamics. Compared with the W 126 model series, they directed much effort towards once again significantly reducing the drag coefficient. The measures included a rearward sloping front section, a larger radius in the transition from the radiator grille to the engine bonnet surface, a somewhat flatter slope to the windscreen, flush-fitted side windows, exterior mirrors with an integrated catch groove for dirty water, generously sized wheel trims and light-alloy wheels, less front-axle lift to minimise crosswind sensitivity and smooth-surfaced design of the underbody. By introducing these measures, the engineers were able to decrease the drag coefficient by a further 16.4 per cent. Although the frontal area increased by 12.2 per cent compared with the predecessor, this S-Class also had the most favourable total resistance value of all S-Class cars since the “pontoon” W 180 model series. This was made possible thanks to its drastically lower cd value. The W 140 beats the W 180 in this regard by 26.8 per cent and outperforms the W 126 model series by 16.4 per cent. 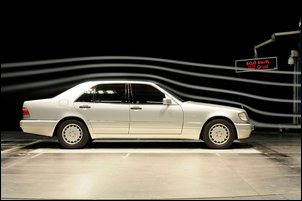 When the W 220 model series of the S-Class was presented in 1998, it achieved a drag coefficient of 0.27. This value was achieved by a number of measures, in particular a slightly sharper slope of the front and rear windscreens, a boot lid with an integrated spoiler edge, a more tucked-in side body, a wheel spoiler in front of the front and rear wheels, a covered engine bay underbody, a sophisticated enclosure concept for the remaining underbody, and a speed-dependent vehicle lowering mechanism. 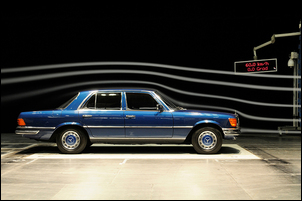 In connection with a 4.2 per cent smaller front surface area and 10 per cent lower cd value, the W 220 model series achieved a 13.8 per cent total drag reduction.